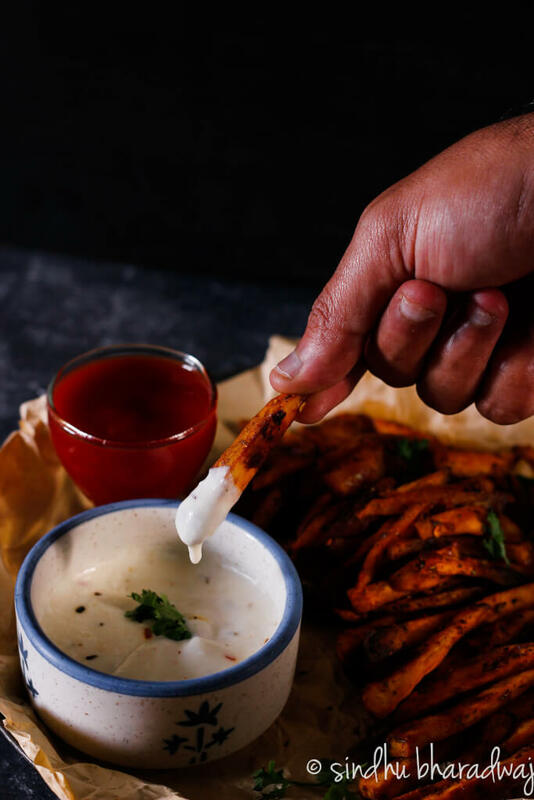 Healthy alternative to potato – these Piri Piri Sweet Potato fries | baked make the best starter for a party, get together, potlucks or just a snack to munch on. The best part is that they are baked and not deep fried. You only require a few ingredients to make this and is ready in 30 minutes! 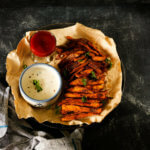 Sweet potatoes are not everybody’s cup of tea, yes, not many like it because it has a cinnamon-y flavour and is sweet (obviously!) and is thought to be a not-so-versatile vegetable. But, I beg to differ. Vegetarians have very few choices when you step out of a particular terrain ( let’s call it the Indian terrain) and according to me, if you’re a vegetarian and you’re picky about eating vegetables you must be willing to eat whatever is available ( including stuff that is not vegetarian) when you step out and not complain about it. Ok Kidding! 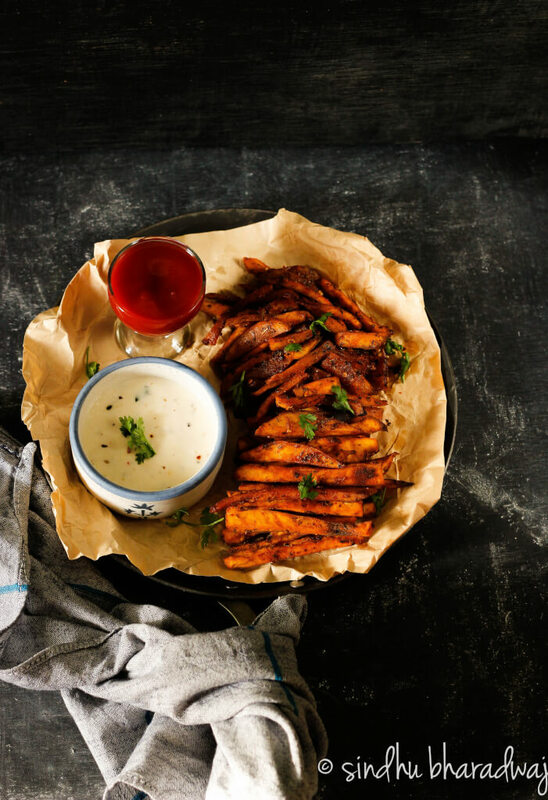 But These piri piri sweet potato fries are irresistible. Yes, plant-based meals are a rage these with vegan smoothies and puddings days and I’m not saying you should eat plant based stuff because of this but it is always nice to appreciate what nature is giving you with all its bounty and enjoy eating all that is edible and plant based. I for one, love sweet potatoes because it is so full of fiber and tastes really good when a stir-fry is made with it. 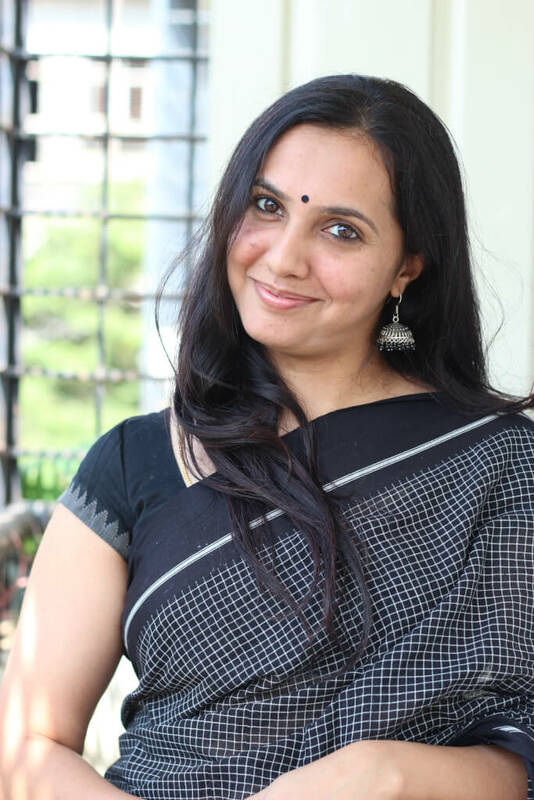 It tastes so good with rasam and with rotis as well. As a matter of fact potatoes and sweet potatoes don’t necessarily have a lot of difference in terms of carbs, but in terms of proteins and minerals, Sweet potatoes are known to be a rich source of Beta carotene and Vit A which is great for the eyes and body in general. They have more grams of natural sugars than regular potato but more overall nutrients with fewer calories. Hence I chose this over the regular fries and also baked it. The baking part gives it a nice smokey flavour and really makes it a guilt free snack to indulge. 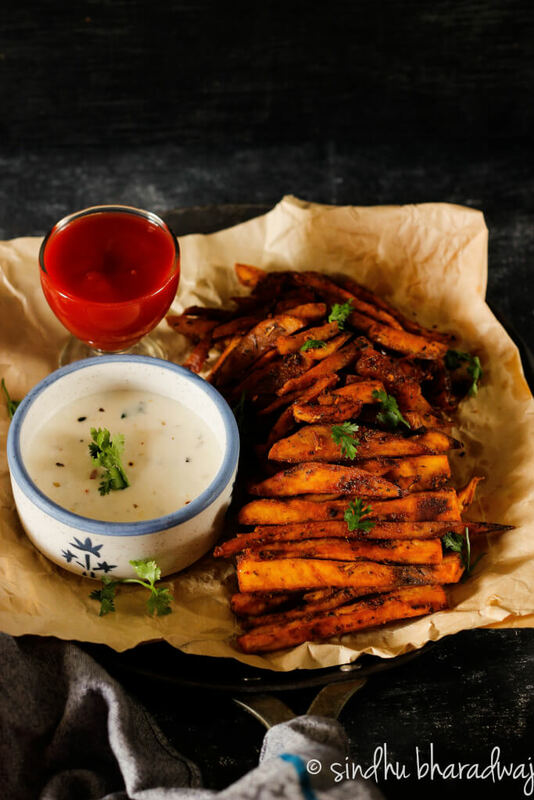 Healthy alternative to potato - these Piri Piri Sweet Potato fries | baked make the best starter for a party, get together, potlucks or just a snack to munch on. The best part is that they are baked and not deep fried. You only require a few ingredients to make this and is ready in 30 minutes! To begin making the piri piri sweet potato fries let us first pre-heat the oven to 200 °C. In a large bowl, mix the olive oil, piri piri seasoning powder, dried herbs, red chilli powder, pepper powder, salt and give it a quick mix. 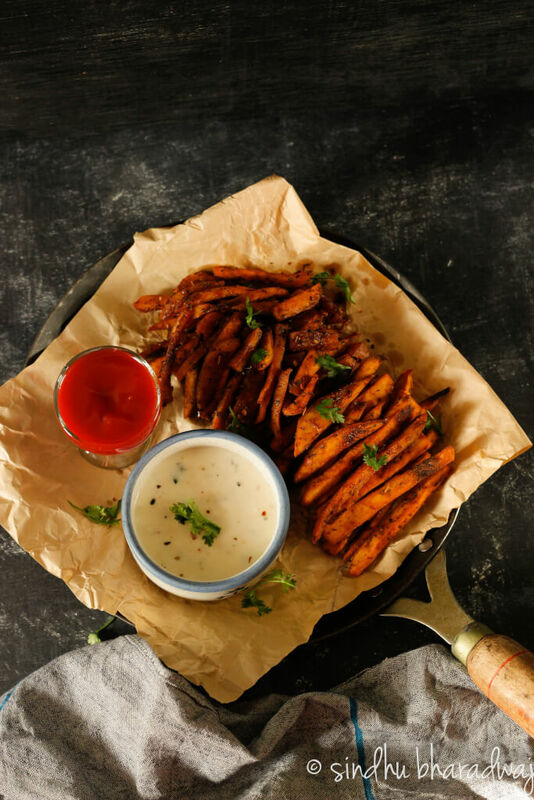 Cut the sweet potatoes into vertical sticks or wedges as per you choice. Now add the slit potatoes into the above marinade and mix the potatoes so as to coat them evenly in the marinade. Leave it for 10 -15 minutes. Line a parchment paper on a baking sheet and sprinkle some oil. Now arrange the wedges/sticks one after the other on the sheet and bake them for 25-30 minutes until they turn golden brown or slightly dark brown. The indication is also that they turn tender. 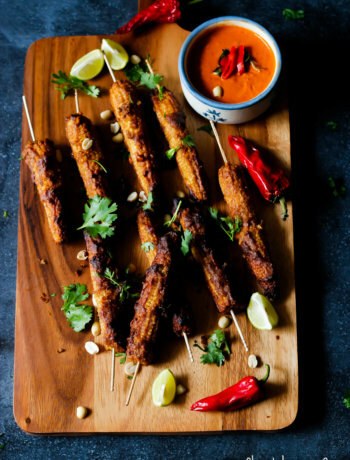 Serve hot with dipping sauce or ketchup. or both 🙂 with a cup of chai. Just mix all the ingredients listed under the 'dipping sauce' table and mix well. You can skip the dipping sauce if you don't prefer it, but it tastes really good. I baked the wedges/sticks in two batches in the oven. If you have a large oven and a large baking tray you can bake it at once. Ensure the sticks are at least 1/2 inch apart from each other. If you don't have an oven/air fryer you can also shallow fry these fries. But just ensure that the sweet potatoes are par boiled for 15-20 minutes on medium flame before shallow frying them. Each oven is different, so please keep a check on the fries after 20 minutes so as to ensure they are not charred.